as it appears along the Grand Canyon it is always stained a brilliant red, for immediately over it there are thin seams of iron, and the storms have painted these limestones with pigments from above. Altogether this is the red-wall group. It is chiefly limestone. Let it be called the red wall limestone. It subsequently became clear that the rock strata that Powell was describing actually span across more than 66 million years of Earth Time, from mid-Devonian to late Mississippian in age. The less dramatic and often quite inconspicuous limestones that make up the Canyon's lower wall were differentiated as the Temple Butte Formation and have been dated as late Devonian in age (around 360 million years old). As we have seen so far, the rock record of the strata in the lower part of the Canyon has only taken us up into mid-Cambrian-age rocks (perhaps 510 or so million years old). Thus yet again we have another significant gap in the Canyon story, with some 150 million years missing between the Cambrian and late Devonian. Neither the Ordovician nor succeeding Silurian periods of Earth Time are represented at all and the early Devonian is missing as well, so there must be another major unconformity. But there is no clear-cut or dramatic evidence of truncated strata, as we have seen before. Indeed, the unconformity can be very difficult to spot, even to a trained geologist. So what was going on? In the western and central part of the Canyon, the Cambrian-Devonian gap is not at all obvious, with Cambrian and Devonian-age dolomitic limestones succeeding one another without an obvious break. However, in the eastern Canyon a trained eye can pick up the visual signs of what are known as channel fill deposits (up to 30 m deep and 120 m wide), cutting down into the strata below - telltale clues to a gap of some kind in the sequence of deposition. But the only way to measure the duration of such a gap is to find some fossils and these are few and far between. Back in the 1880s, Walcott's expertise as a field palaeontologist allowed him to find some - brachiopods, corals, snails and most usefully some fish remains. These latter are the fossilised, bony, scale-like skin plates of a curious and distinctly Devonian-age fish. Called Bothriolepis, this was just one of many bizarre jawless (agnathan) fish that lived in the lakes and rivers of the vast Laurentian continent. They were some of the first fish to adapt to living in the freshwater rivers and lakes that traversed the otherwise barren landscapes of the continent's hot and arid interior. 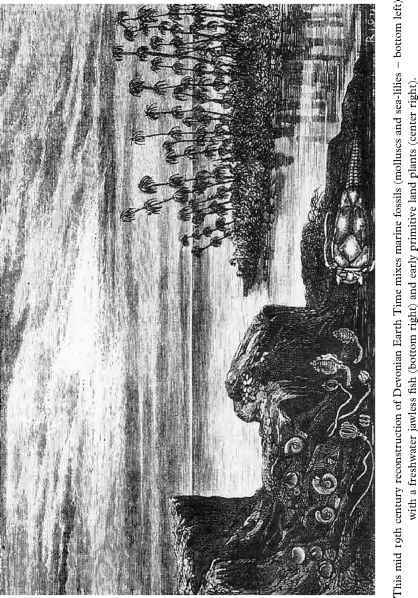 Laurentia straddled the equator at this time and although a variety of primitive land plants had evolved, they were all restricted to low-lying wetlands surrounding coastlines, rivers and lakes. Without soils, the landscapes were subject to intense weathering and erosion. But there was abundant life where there was water. Many of the jawless fish had thick, bony plates covering their bodies, forming a tough, leathery armour that helped protect them from large arthropod predators (such as the scorpion-like eurypterids) and life in the rough and tumble of fast-flowing waters. These armoured agnathans were so diverse and rapidly evolving that in some regions such as Baltic Russia their fossils can be used as age-related biozonal markers. By identifying particular species of armoured agnathans, it is possible to determine the exact part of Devonian Earth Time to which the strata containing them belong, at least to within a million or so years. The presence of freshwater armoured agnathans here in shallow intertidal to subtidal carbonates, mixed with sea-living creatures such as brachiopods, shows that the agnathan remains were washed down by rivers and dumped in coastal sedimentary environments. So land was still not far away to the north and east, but in this part of the continent is not represented by any sedimentary equivalents of the Old Red Sandstone such as we have met before in Britain. In Greenland, however, river and lake sediments of late Devonian age contain some of the most interesting and important fossils in the history and evolution of backboned animals like us - the earliest-known four-legged animals. Their initial discovery in the early decades of the twentieth century is a quite extraordinary story. In 1897 a Swedish engineer and balloonist called Salomon Andrée went missing while trying to reach the North Pole and an expedition was sent to Greenland to see if they could find any trace of him. They did not, but the party spotted some interesting-looking fossil bones on a bleak mountainside called Celsius Bjerg. Not until 1931 was Swedish geologist Gunnar Save-Soderburgh able to recover more samples. 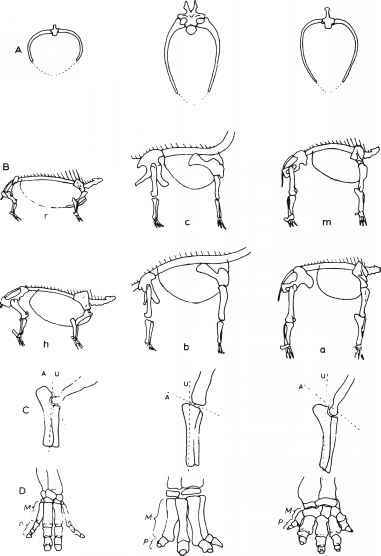 He handed them over to palaeontologist Erik Jarvik, who made a meticulous study of them, eventually published in 1952. Ichthyostega (meaning 'fish-roof) is a metre-long salamander or newt-like animal with a heavy, flat bony skull and four legs (known as a tetrapod). Jarvik portrayed it as the first animal capable of leaving the water and walking onto dry land, but he was only partly right. By the 1980s, Jenny Clack, a young Cambridge researcher, was reviewing the fossil evidence for the evolution of the first tetrapods. She had seen Jarvik's specimens and had some questions about his interpretation, but needed her own specimens as Jarvik was still working on them. As luck would have it, she discovered that some Cambridge geologist had collected fossils from the same area in Greenland and these turned out to be the remains of a closely related animal called Acanthostega. They were enough to warrant further collecting, which brought more specimens to light. Anders Erik Vilhelm Jarvik, 1907-98, Swedish palaeontologist and graduate of Uppsala, joined the Swedish Museum of Natural History (Naturhistoriska Riksmuseet) in 1934, becoming professor in i960. He made pioneering and very detailed studies of extinct Palaeozoic fossil fish and early tetrapods. unlikely that it ever ventured onto land. Instead, its limbs were an adaptation for survival in fast-flowing river waters and feeding on small arthropods and perhaps small fish. Also, the hands and feet did not have five fingers and toes, as Jarvik had claimed, but eight fingers and seven toes. Recently Jenny Clack and Per Ahlberg have described another new, closely related genus of tetrapod from Celsius Bjerg. The presence of at least three distinct animals living in the same environment at this time tells us that their ancestry must stretch back into the more distant past of middle or even early Devonian times. Per Ahlberg later in 1991 found an even older tetrapod called Elginopteron in the Old Red Sandstones of northern Scotland and, in 2000, Panderichthys (meaning Pander's fish and named after Christian Pander, the nineteenth-century Russian palaeontologist), a Devonian lobe-finned fish of the kind from which these early tetrapods probably evolved. Just to make the story even more intriguing, fossil trackways have been found in Ireland and Australia, which show that there were tetrapods capable of moving across wet sediment beside the rivers and lakes of Devonian times. Unfortunately, no bones have yet been found associated with these trackways. In recent decades the relative dating of these Devonian limestones has been aided by the discovery of marine microfossils known as conodonts (meaning 'cone teeth'). As we have seen (p. 177), these tiny, tooth-like fossils were originally discovered and correctly identified as belonging to some kind of extinct fish by Christian Pander. But for the following 120 years and more palaeontologists argued about what kind of organism they belonged to. The problem was that they were not found with any other 'fish-like' vertebrate remains such as backbones or scales. Nor did the so-called teeth seem to show any signs of wear, something that might reasonably be expected if they were indeed used for grasping, killing and cutting up prey. Nevertheless, the widespread and common occurrence of conodonts in limestones of Palaeozoic age meant that a great deal of effort went into the study of their taxonomy and distribution in both time and space. It was realised that the conodonts occur as paired left and righthand elements and that there were a variety of forms from spiky cones to flat 'platform' elements that might belong to the same parent animal. Many different form-species were distinguished, based purely on morphological distinctions of individual paired elements. Some of these turned out to have restricted time ranges, which make them very useful for separating successive strata in the same way that ammonites and graptolites do. Identification of conodonts from low levels in the Temple Butte limestones in Matkamiba Canyon indicates the presence of the Polygnathus assymetricus biozone, which is of late Givetian age. Givetian is the uppermost of two international stages recognised in the middle Devonian whose boundaries have been calculated from evidence elsewhere to range from 391.8 ±2.7 million years to 385.3 ±2.6 million years old. Thus the Givetian stage spans some 7 million years and we can reasonably date this occurrence of conodont fossils and the limestone strata containing them, with some considerable accuracy, at around 386 million years old. Late Frasnian conodonts, some 376 million years old, occur near the top of the Temple Butte limestones, showing that the whole formation was deposited over a period of about 10 million years. The ability to make such accurate estimates is the result of many years of research by numerous scientists around the world - conodont palaeontologists, biostratigraphers specialising in Devonian sediments, and specialists in radiometric dating. The top of the Temple Butte strata and its junction with the overlying Redwall Limestone is marked by an irregular erosion surface, sometimes with a pebble conglomerate. This tells us that there was a temporary retreat of the seas, of sufficient duration to allow some weathering and erosion of the uppermost Temple Butte strata before the sea next flooded the land. What regional uplift there was must have been gentle, because there are no significant angular discordancies between the strata above and below the unconformity, but there was enough time for some locally prolonged weathering and erosion. sometimes this stands in two, three, or four Cyclopean steps - a mighty stairway. More often the red wall stands in a vertical cliff 1,600 feet high. It is the most conspicuous feature of the grand facade and imparts its chief characteristic. All below is but a foundation for it; all above but an entablature and sky-line of gable, tower, pinnacle, and spire ... broken into vast amphitheaters, often miles around, between great angular salients. The amphitheaters also are broken into great niches ... vast chambers and sometimes royal arches $00 or 1,000 feet in height. Analysis of the limestone sediments shows that they were laid down in a widespread shallow continental shelf sea. The massive carbonate cliffs of the Redwall Limestone look as if they were laid down in one prolonged phase of offshore deposition on a gradually subsiding seafloor. However, detailed examination shows that even here there were two phases of deposition separated by a temporary withdrawal of the sea. Overall the carbonates were laid down over a large area and are preserved today over much of the Colorado Plateau and southern Rockies. But again, the seas began to withdraw at the beginning of late Mississippian times. The recently formed limestones were exposed to subaerial weathering, which lasted for some millions of years, sufficient for the development of karst landscapes. As we will see, limestones can be chemically weathered by dissolution in slightly acidic rainwater. Deep fissure and cave systems channelled water into a west-flowing drainage system. Some caverns were enlarged to such an extent that they collapsed, creating surface hollows and narrow channels up to 120 m deep in which younger terrestrial and nearshore lagoonal sediments accumulated. Some of the east-west extending channels have been traced for up to 130 km (80 miles). The upper Mississippian strata formed from these sediments include terrestrial red soils and a variety of marine strata, known as the Surprise Canyon Formation.